Bilella, A., Alvarez-Bolado, G., & Celio, M. R. (2016). The Foxb1-expressing neurons of the ventrolateral hypothalamic parvafox nucleus project to defensive circuits. Journal of Comparative Neurology, n/a-n/a. doi: 10.1002/cne.24057. Cvetanovic, M., Hu, Y.-S., & Opal, P. (2016). Mutant Ataxin-1 Inhibits Neural Progenitor Cell Proliferation in SCA1. The Cerebellum, 1-8. doi: 10.1007/s12311-016-0794-9. Delpech, J.-C., Wei, L., Hao, J., Yu, X., Madore, C., Butovsky, O., & Kaffman, A. (2016). Early life stress perturbs the maturation of microglia in the developing hippocampus. Brain, Behavior, and Immunity. doi:http://dx.doi.org/10.1016/j.bbi.2016.06.006. Herring, A., Münster, Y., Akkaya, T., Moghaddam, S., Deinsberger, K., Meyer, J., . . . Keyvani, K. (2016). Kallikrein-8 inhibition attenuates Alzheimer’s pathology in mice. Alzheimer’s & Dementia. doi:http://dx.doi.org/10.1016/j.jalz.2016.05.006. Herring, A., Münster, Y., Metzdorf, J., Bolczek, B., Krüssel, S., Krieter, D., . . . Keyvani, K. (2016). Late running is not too late against Alzheimer’s pathology. Neurobiology of Disease, 94, 44-54. doi:http://dx.doi.org/10.1016/j.nbd.2016.06.003. Madhavadas, S., & Subramanian, S. (2016). Cognition enhancing effect of the aqueous extract of Cinnamomum zeylanicum on non-transgenic Alzheimer’s disease rat model: Biochemical, histological, and behavioural studies. Nutritional Neuroscience, 1-12. Pantazopoulos, H., Wiseman, J. T., Markota, M., Ehrenfeld, L., & Berretta, S. (2016). Decreased Numbers of Somatostatin-Expressing Neurons in the Amygdala of Subjects With Bipolar Disorder or Schizophrenia: Relationship to Circadian Rhythms. Biological Psychiatry. doi: 10.1016/j.biopsych.2016.04.006. Pellegrini, C., Fornai, M., Colucci, R., Tirotta, E., Blandini, F., Levandis, G., . . . Antonioli, L. (2016). Alteration of colonic excitatory tachykininergic motility and enteric inflammation following dopaminergic nigrostriatal neurodegeneration. 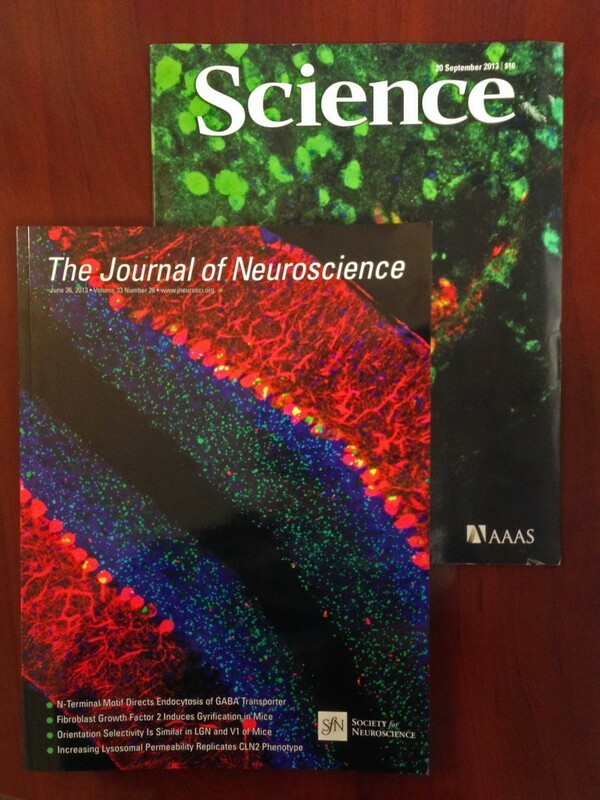 Journal of neuroinflammation, 13(1), 1-13. doi: 10.1186/s12974-016-0608-5. Perez, E. J., Cepero, M. L., Perez, S. U., Coyle, J. T., Sick, T. J., & Liebl, D. J. (2016). EphB3 signaling propagates synaptic dysfunction in the traumatic injured brain. Neurobiology of Disease, 94, 73-84. doi:http://dx.doi.org/10.1016/j.nbd.2016.06.007. Sandhu, M. S., Ross, H. H., Lee, K. Z., Ormerod, B. K., Reier, P. J., & Fuller, D. D. (2016). Intraspinal transplantation of subventricular zone-derived neural progenitor cells improves phrenic motor output after high cervical spinal cord injury. Experimental Neurology. doi: http://dx.doi.org/10.1016/j.expneurol.2016.06.007. Vannini, E., Olimpico, F., Middei, S., Ammassari-Teule, M., de Graaf, E. L., McDonnell, L., . . . Caleo, M. (2016). Electrophysiology of glioma: a Rho GTPase-activating protein reduces tumor growth and spares neuron structure and function. Neuro-oncology. doi: 10.1093/neuonc/now114. Zhang, Z., Bassam, B., Thomas, A. G., Williams, M., Liu, J., Nance, E., . . . Kannan, S. (2016). Maternal inflammation leads to impaired glutamate homeostasis and up-regulation of glutamate carboxypeptidase II in activated microglia in the fetal/newborn rabbit brain. Neurobiology of Disease. doi:http://dx.doi.org/10.1016/j.nbd.2016.06.010. Zhou, X., Pace, J., Filichia, E., Lv, T., Davis, B., Hoffer, B., . . . Luo, Y. (2016). Dopaminergic neurons. Experimental Neurology. doi: http://dx.doi.org/10.1016/j.expneurol.2016.06.013. Butler, B. E., Chabot, N., Kral, A., & Lomber, S. G. (2016). Origins of thalamic and cortical projections to the posterior auditory field in congenitally deaf cats. Hearing Research. doi:http://dx.doi.org/10.1016/j.heares.2016.06.003. Kim, E. R., Lew, P. S., Spirkina, A., & Mizuno, T. M. (2016). Xenin-induced feeding suppression is not mediated through the activation of central extracellular signal-regulated kinase signaling in mice. Behavioural Brain Research, 312, 118-126. doi: http://dx.doi.org/10.1016/j.bbr.2016.06.026. Posted in Customer News, MBF Company News, Software and tagged citations, Customer Research, Lucivid, Neurolucida, Stereo Investigator.